« Siesta Scripture Memory Team 2015: Verse 1! This entry was posted on Monday, January 5th, 2015 at 10:25 am	and is filed under simulcast, Travis, Uncategorized. You can follow any responses to this entry through the RSS 2.0 feed. You can skip to the end and leave a response. Pinging is currently not allowed. My day was totally dragging along until this showed up in my email. I so needed this today! THANK YOU!I have been waiting for this to be put to music since I attended conference in Fort Wayne. So special and meaningfull to me. Bless you all and thanks again! I am so excited to see this! I knew you all would not disappoint. Love to all you at LPM and to Travis and team! Thank you!! So excited to have this! LOVE THIS! 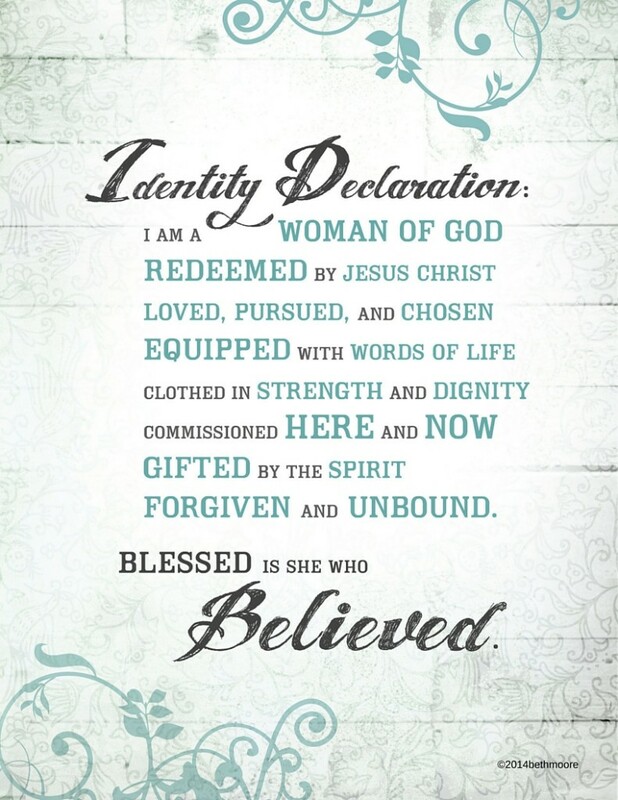 Great way to start off the new year – being reminded of who we are in Christ. Thank you! LOVE THIS!!!! Thank you so much for your hard work. Thank you so much for the hard work to do this. So awesome! Thank you. I love the song. I am looking forward to a great year with the Siesta. This is my 1st year! I just thought about this the other day and was trying to recall the words and melody — thanks for doing this! Blessed is she who believed!!! Not enough words just…..WOW GOD!!!!! Awesome!! Thank you so much to the ladies & Travis’ entire team! This is spectacular! Thank you–we are daughters of the King! Love, love, love this!!!! And we ARE Blessed!!! Yay! Been hoping for this. Shared this with my retreat team, but I just couldn’t sing it this cool! Thank You. Praise God this has become my mantra this year! Standing on this word. I just made my wallpaper this. I did it prior to this post. I read it aloud every morning when I check my email and facebook over coffee. Very cool. Thank you ladies for recording this song it has been in my head since I heard it in September. What a great song! Thank you for the encouraging words. I loved this the first time I heard it! Thank you for sharing it with us. Please thank Travis and his team for their work on it. ALL RIGHT!!! I have been waiting for this ever since you announced Travis and team were working on it! THANK Y’ALL! Thank you! I can totally see you and the girls dancing around to this song :). Love this ~ thank you for sharing! Love this ~ thank you for sharing and bless Travis and his team! Didn’t see the simulcast but thanks for sharing the song…it’s great! WE have been anxiously awaiting this song!! Hearing it takes me back to September 13. What an amazing Simulcast! To see 12,000 women fill the Coliseum and then raise the roof with their voices praising our Lord. Awe inspiring. Thank you! That was tastefully done and just awesome! Thanks to all involved with the making of this song. It ministered to me! I’m from Seattle Wa. And I love this song and Identity Declaration! I love the song! Thank you! This just made me so happy!!! My sister and neice and I were just singing it this weekend!! Thank you so much!! I needed this tonight! God is so good!! Praise God! So awesome! Thank you for sharing. Thank you so much! Happy New Year to all at Living Proof! Thank yo so much for this beautiful song, it is now my theme song for 2015 I LOVE it!! God is so Great I just told my family on Jan. 1 my word for this year is Believe and then today I find this. Thank you JESUS!! Hallelujah. Wow, I had just remembered that session this weekend and was humming the song because I don’t know the words. I’m so happy it was officially recorded! Fabulous!!! Would love to have been at the conference. Powerful, thank you!!! LOVE this!! It is a reminder we need on most days. Thank you SO very much! Thanks so VERY MUCH!!! That song has been deep in my heart ever since the simulcast. What a gift to be able to have the recording!!! YAY!!!!!!!!! I love, love, love this!!! How wonderful to put this to music!!! Thank you to you for such wonderful words and for Travis and his team for making the music!!! What a fabulous gift!!! Thank you so much for doing this for us!! What a blessing. Such a powerful song and testimony! Love, Love, Love the song and the MUSIC!!!! Lifted my spirits as I sit here in this hospital room tonight watching my man sleep in that bed, praying and hoping that the doctors will soon find out what’s causing the high fever, infection, abdominal pain, and low white blood cell count. we just came through a season of testing and trials last year with my son3(34 years old testicular cancer) GOD HEALED HIM!!!! !They removed it all and nothing is there now. He’s doing great! No signs of it at all! Then my husband found out he had prostate cancer and it needed to be removed. Ladies, that devastated both of us for we are both fairly young still and this affects the intimate part of your marriage. He is 62 and I am 55. But our main concern was his health and remaining here with me as long as God would allow. My faith has been pushed to it’s limit and I sometimes wonder if I have passed the test or not. I’ve held on to the hand that has held me and never let go! Now with this new scare I wonder if his cancer is back , but I’m trying not to let the enemy in and destroy my thinking. This is where these memory verses are coming in so very helpful and needful this year. I’m not publicly on the website taking part for various reasons but trust me I AM doing them!!!! Thank you Beth for introducing this process to me. You’ll never know what a blessing and mentor you have been to me over the years. In Christ love Carla I’m sorry for such a long post; use it as a sincere prayer request and heartfelt praise for His love and faithfulness to me!!!! What a trying time you have had. Read your post this morning. Hoping that you and your man are home and healthy. There is a joy that is found as a result of suffering. Praying that you experience it.